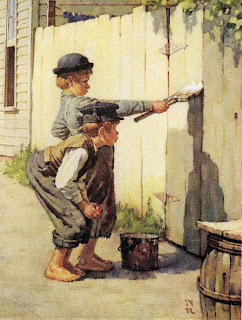 When I was a kid, I used to love looking at Norman Rockwell's paintings. They seemed to be everywhere back then...on calendars...on magazine covers...we even had a quartet of jigsaw puzzles based on his famous "Four Freedoms" posters. But I learned early-on never to refer to Rockwell as an artist. Every time I did, someone (usually an art teacher) would sneer, "He's not an artist...he's an illustrator." I wasn't sure what the difference was, though someone once explained: "An illustrator's work is on the cover of SATURDAY EVENING POST. An artist's work is in a museum." So I've been chuckling every night this week as I pass a billboard on the side of the expressway announcing a major Norman Rockwell exhibition at our city's museum, the Detroit Institute of the Arts. I guess he was an artist after all! One day during my lunch hour, I'll have to walk across the street and see this exhibit for myself. I wonder if it will include any of the illustrations he created for children's books. He only did a handful. 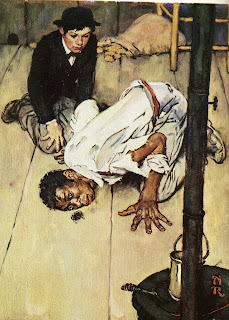 In the late 1960s, the psychiatrist Robert Coles approached Norman Rockwell about illustrating a children's book concerning the then-controversial topic of desegragation. The two men traveled together, with Coles interviewing urban families about educational issues, while Rockwell sketched portraits of their children. Though written in the form of a novel, DEAD END SCHOOL is clearly a polemic with a strong social agenda -- and is even classified as nonfiction in some libraries. But Rockwell's relaxed black-and-white illustrations help to make this 1968 book more accessible and inviting to young readers. 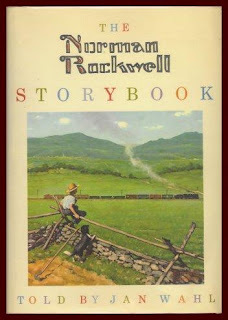 The most unusual Rockwell work for children may be THE NORMAN ROCKWELL STORYBOOK. In this oversized 1969 volume, Jan Wahl (of PLEASANT FIELDMOUSE fame) contributes twenty very short stories inspired by some of Rockwell's best-known paintings. 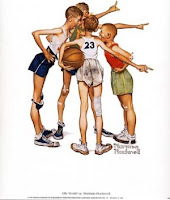 Actually, Norman Rockwell's biggest contribution to children's books probably doesn't come from any illustrations he produced, but rather from a child he produced. The artist's middle son, Thomas Rockwell, grew up to become a writer of children's books, most famous for the irresistibly-titled novel HOW TO EAT FRIED WORMS. Published in 1973, this crude and comic story is hugely popular among young readers (if not among critics), has won many "kids' choice" book awards, and has been filmed for both television and the big screen. Although future Caldecott winner Emily McCully did a fine job with the illustrations for HOW TO EAT FRIED WORMS, I'd love to have seen what Norman would have done with the material. I'm surprised Thomas didn't throw his dad the illustrating job. Yeah, yeah, I know...it's the editor, not the writer, who picks the illustrator of a book...but do you really think any editor would have turned down the opportunity to work with Norman Rockwell? And just think, if Norman had illustrated this book, the Detroit Insitute of Arts might right now be exhibiting a painting of Rockwell's distinctive, comically all-American boys contemplating a plate of squriming worms. 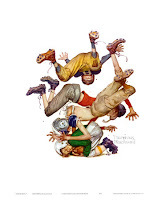 I have seen several Norman Rockwell exhibits and find them delightful! My mother had posters hanging in our den of the Four Freedoms. According to the MAZZA Museum in Findlay, those who draw pictures for children's books are artists not illustrators. They are quite emphatic about it. Always great to read your thoughts. Thanks. Don't forget his book, "Willie was Different." Unless you are excluding that for some reason? We saw a wonderful Rockwell exhibit a few years ago. You'll enjoy it! It's funny the ridiculous arguments people will make to prevent Rockwell and Wyeth from being considered artists. Thus the Treasure Island paintings aren't art, but a landscape Wyeth knocked out while on vacation is. I just saw a Norman Rockwell ABC book which got donated for the library sale last week. Actually, I got that wrong. It is a counting book, not an alphabet book! The Woodman and "The Writer from Philadelphia"
"And Tell All the Stars Above...."
GRAVEYARD BOOK TO BE STRIPPED OF NEWBERY?